“Multi-Comfort” is a term our parent company, Saint-Gobain uses to describe a leading-edge approach to architecture that creates a healthier and more productive work environment by providing building occupants with an optimal indoor environment while having lower environmental impact and allowing occupants to be closely connected with nature. A nice goal, but it can be hard to deliver, and that is exactly why Saint-Gobain decided it needed to practice what it preaches. 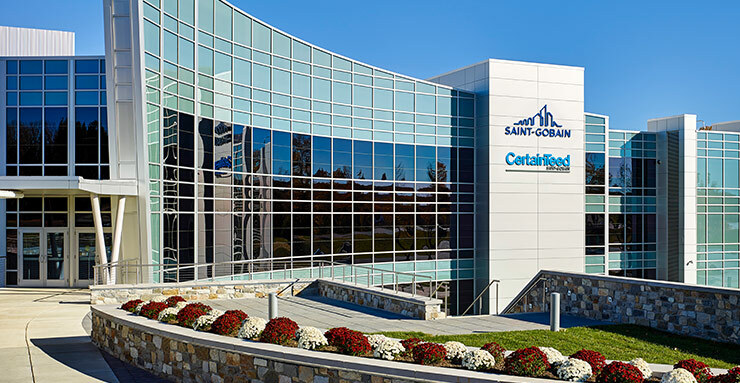 In 2015, Saint-Gobain decided to move its North America Headquarters from Valley Forge, Pa., to Malvern, Pa., and, in the process, create a one-of-a-kind building for its people that would demonstrate what “Multi-Comfort” is all about and, most importantly, how it improves the performance of people. After years of study the results are in, and they are impressive. The study, conducted in four phases over 36 months by leading researchers from the University of Oregon’s High Performance Environment (HiPE) Lab in partnership with Saint-Gobain building scientists, first measured the old HQ and surveyed team members on a variety of indoor environmental factors. They measured and analyzed the new HQ prior to occupancy and then conducted two post occupancy surveys, one in 2016 a year after move-in and one in 2017 two years’ after. Among the parameters evaluated were indoor air quality (IAQ), thermal comfort, visual comfort, acoustic comfort as well as assessments of overall satisfaction and productivity. The infographic below highlights some of the top level findings. Productivity: The average employee reported feeling 39 percent more productive in the Malvern headquarters. This perceived productivity correlated with two components of measured productivity. The Call Center improved its productivity 140 percent during the first three weeks’ post-occupancy, with no changes in hours or staff. Similarly, the Sales Support group generated leads 150 percent more effectively during the first five weeks post occupancy (compared to the same time period the previous year). Health: The average employee reported a 54 percent improvement in perceptions of health and well-being. Spatial Daylight Autonomy (sDA, the daylight sufficiency metric used by LEED), showed the amount of space receiving usable daylight during occupied hours increased from 25 percent to 85 percent. Daylight Glare Probability (DGP), the likelihood an occupant experiences distracting or uncomfortable glare, decreased from 40 percent to 10 percent. 92 percent of team members have access to daylight and views of nature from their workspace. The results speak for themselves. The study also adds to the body of research demonstrating that the human impact benefits of better buildings are not relegated to controlled lab settings; they are felt in the real world, by real people. As the “test subjects” in this case are my colleagues, I have had the chance to ask them about this myself. Without exception they rave about the new facility. I have heard many stories of people getting sick less often, being less impacted by allergies and just more excited to come to work each day. Here, the anecdotal supports the empirical, which leads me to the inescapable conclusion that the Multi-Comfort approach truly delivered a better building for the people inside. As a result, both the people, and the company, are better off because of it.